Roland Sands and his SoCal crew have done it again. Drawing inspiration from the cafe scene in late-1950s/early-1960s London, they have just announced the Clash Leather Jacket. This jacket will look equally at home on a retro machine or a certified classic. Either way, this is a tough looking piece and is sure to get noticed. 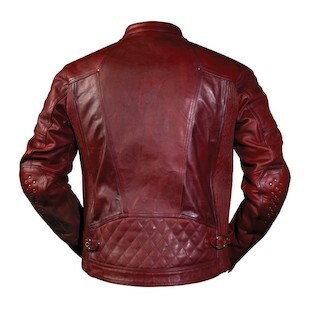 The leather is hand finished, washed and waxed 1.1mm top grain hide. 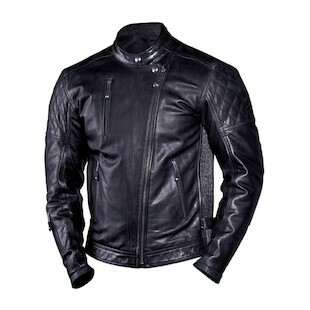 An offset zipper and quilted accents at the shoulders and lower back set this jacket apart from the rest of the pack. Reinforced, riveted elbows are there for that authentic rocker look and it is available in either black or “Oxblood Red,” both of which completely back up their retro-badassery with available CE-rated armor. You know - Just in case you needed to cruise down to Brighton Beach for a scuffle with the local mods. The strong pre-curve in the shoulders and elbows tells the jackets true intentions. It truly is meant for use astride a performance machine. The stretch leather accordion panels underneath the arms and the adjustable straps at the waist will let you achieve a snug, aggressive fit. The drop-tail on the RSD Clash will help avoid showing any unnecessary skin when you’re reaching for those clip-ons. There are also plenty of zippered pockets both internal and external for things like your cell phone, a screwdriver to adjust the carbs or even that “coup de poing americain” you keep hidden. So you think that machine you’re sitting on can hit the ton? You’ll need to gear-up if you want to try. Throw a song on the juke box. Anything by Eddie Cochran or Chuck Berry will do. Kick the bike over on the first try with everyone watching. Hope the chain is still in adjustment and the points are still good. Kick it into first and light up the back tire a bit. If anything goes wrong, be glad you’ve got your Roland Sands Clash Jacket on otherwise they’ll be picking gravel out of you for the foreseeable future. The ton-up boys will be waiting to hear back from you. It’s time to hit the road. You’d better hit it hard and be ready if it hits back.